Her story has been on repeat all over the news, reaching the interest of Good Morning America and CNN. 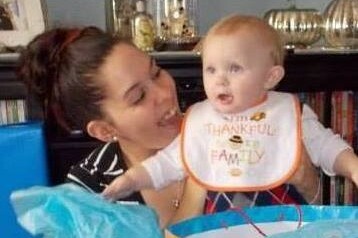 On May 7, 2014 Christina Simoes and her 18 month old son were trapped in a 3 alarm fire on the third floor in Haverhill, MA. She had waited as long as she could for their rescue but was trapped by smoke. Christina was forced to make a sacrificing decision to jump--Camron wrapped in her arms--from the third floor. Not knowing if she would survive, in her heart her son will. To everyone's amazement both Camron and Christina survived the fall. The latest update stated Christina may suffer paralysis for the rest of her life, and when questioned about her condition, her only concern was her son's well-being. 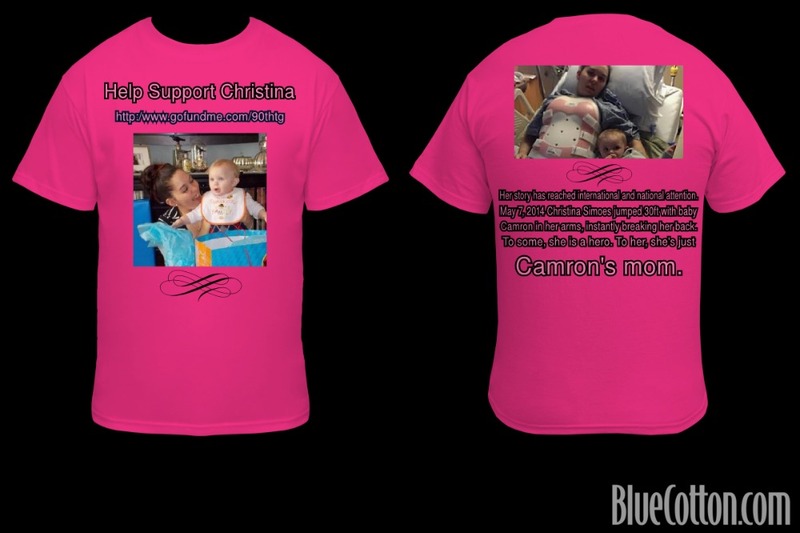 Reading comments many viewers had suggested a place of donation, which is why I had created a GoFundMe for Christina. What she considers not a big deal and more of an act of her motherly duty, others view Christina as a true definition of what a mother is. For many, she is a hero. If you prefer to send a donation by check, please contact me personally. Thank you all and God bless! "10 week update and the one that I have been working so unbelievable hard towards. I walked today with one crutch holding my baby boy. Never have I been more excited to feel him in my arms. I know you can't see this but thank you for saving me and making me be able to be Camrons mom Shelby and Kristen I love you both." "7weeks 2days I am now able to climb stairs while just being supervised. I can use the bathroom unassisted. I can transfer to and from my bed to my chair unassisted. I took my first steps not holding on to anything with just Shelby supporting my hips.Today I walked 195 ft with my new crutches, and balanced on a foam board with a ball between my knees. Also "shopped" in the fake shaws downstairs. I'd say were making progress. I am trying not to bother people on a daily basis. I understand when you contribute a donation your e-mail is required for updates and such. Some have requested to unsubscribe :-/ Thank you all for every thing you have done for Christina and her family. We have raised over $40,000 but I want to reach the $50,000 goal. Since my last update Christina is finally starting to pass the blood clots, her catheter has been removed, she has been able to use the facilities on her own as well as shower, and has walked 208 ft as of today. 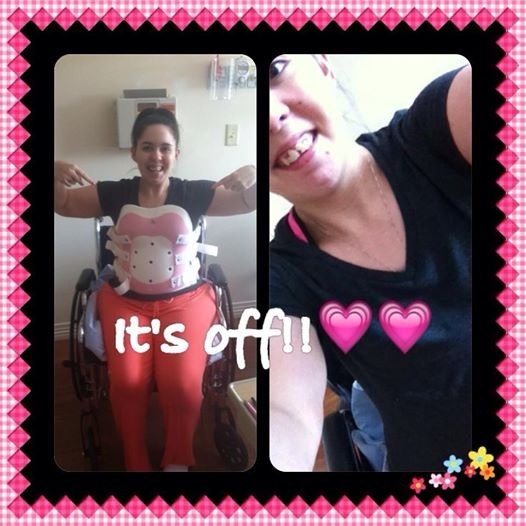 She has a remarkable strength and motivation for her recovery. Every day turns into a milestone. Thank you all, God bless! Today is Christina's 25th birthday! Please show some love of writing a comment--she makes a point to read them daily--to make her day that much better. The preview of Christina's interview aired tonight, which we were told differently. Her actual interview will be aired Monday, June 2nd, at 7 P.M. (Boston area). Happy Birthday, dear Christina! May the year that is ahead of you, be filled with lots of victories and joy, as you grow stronger and stronger, and enjoy the love of your little boy! Bless you, brave lady! Wishing you the happiest of birthdays! You are an amazing woman and the whole world sees it! God Bless you and your family! Happy birthday Christina! Best wishes for you and your family!! Happy Birthday! We are all on your side. Take care! WTG!! !SHE TOOK HER FIRST STEPS TODAY!! You are the best example of what a mother is. I hope everything gets better for you, we are thinking of you everyday. I know some folks who are uncomfortable sending cash to an individual/family (any individual/family) vs sending cash to an established trustee - i.e. American Red Cross or someone w/solid track record of handling lg sums of $ to pay medical bills, family expenses, etc. If a trustee can be found to do that, I think you will see even greater financial gifts roll in. Unfortunately, bad examples of giving lg sums of $ to individuals and the $ gets spent, but not on what the givers thought it would go to. Just sharing. Trying to share a way to open the wallets and hearts of many many more givers and helpers. I also sent her story to The Ellen Degeneres Show! I was curious if there is an address to send toys, clothing, get well card, etc... ? I'd really like to send some things. This story touched my heart I have a 19 month old daughter and i can only imagine how hard this is for her to not be able to run around with that sweet baby. Imagino que você fale Português ,portanto quero te parabenizar na minha língua.Fiquei muito feliz por saber que você está se recuperando a cada dia,Que Deus continue abençoando você e sua família ! Brave Mom getting well for baby--best wishes. You go girl! I am the mother of 5, three of whom are grown- maybe even your age. I am so proud of you--not just your courage then...but your courage and determination now.